So, I got this cool spray on Banana Boat sunscreen to make sure I keep screening up in winter – and it’s so easy to apply – look!! No messyness, no white stuff, smells alright too! UV in Australia can still be pretty damn intense even when you’ve only got your face exposed to the elements. Any more than the 10 mins for vitamin b is still a bit much for pasties like me. 1400 people died from skin cancer each year in Australia. 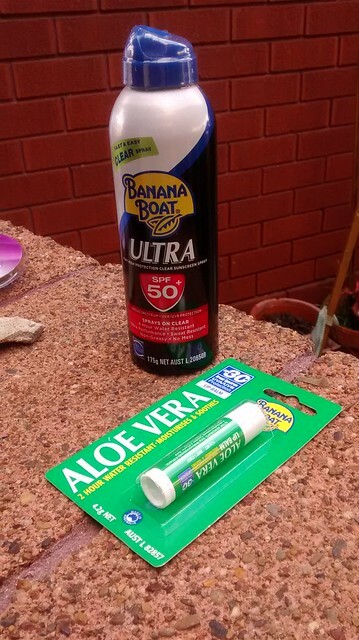 Things like Sunscreen lip balms are amazing for keeping your lips from becoming cracked and ewie. Want to give this spray on sunscreen a try? I have two cans to giveaway to Australian based readers. Just follow the instructions in the Gleam giveaway widget below. ← Rimmel Oh My Gloss! I moisturise like crazy in winter, of course it always has to have a high SPF factor. Im heading for a dream trip to LA and Las Vegas in 8 weeks time so sunscreen is on the shopping list for sure. Having seen the effects of the sun on a cousin that had skin cancer and lost a huge chunk of her face at a young age, I try and make sure the entire family is sun safe. It doesn’t always work. My hubby is of the misconception that you don’t need to keep up the sunscreen in winter and his skin is more suspectable to skin cancer, so I do worry. I’ve only just discovered the secret of applying sunscreen in winter, every day. It keeps my skin moist and shiny rather than dry and lifeless. It really is a revelation. I slather my body with moisturiser as soon as I hop out of the shower, to keep my skin silky soft during winter. My skin is happy when I’m happy. And I’m happy when I’m healthy and hydrated. I get out and enjoy life in our great land. An Australian winter is no excuse for going into hibernation! Drinking plenty of water to make sure my body and skin is hydrated! It does make a huge difference and my skin loses its ‘glow’ if I forget for a few days. No matter what I do (keep hydrated, moisturise and eating lots of fruits and veggies), I can’t get around the pasty, winter look. Love to get some sun the right way so I’ll always have the “cool bananas” summer look always. Things become dry when there is not enough water. Drinking it adds it from the inside and moisturiser adds it from the outside. Drink lots of water to keep hydrated, and a good moisturiser, so my skin is happy inside and out.